The Korea Herald is publishing a series of features and interviews on South Korea’s business environment for foreign companies and investors. This is the twelfth installment. -- Ed. Regulation is a topic that frequently comes up among foreign companies doing business in Korea. And that makes sense, as Korea ranks 51st among 67 countries on the FDI Regulatory Restrictiveness Index compiled by the Organization for Economic Cooperation and Development. However, James Kim, chairman of the American Chamber of Commerce, contended that Korea is still not excessively particular in the regulatory environment and that any foreign companies doing business in any country should take different approaches to follow the nations’ own set of rules and regulations. Kim formerly served as CEO at GM Korea, Microsoft Korea and Yahoo Korea over the past 15 years. Uber was fined 20 million won ($17,985) as the Seoul court ruled in June that the firm illegally used private vehicles for commercial purposes. Barney Harford, Uber’s chief operating officer, came to Korea in July and vowed to follow the rules here and look for new opportunities. 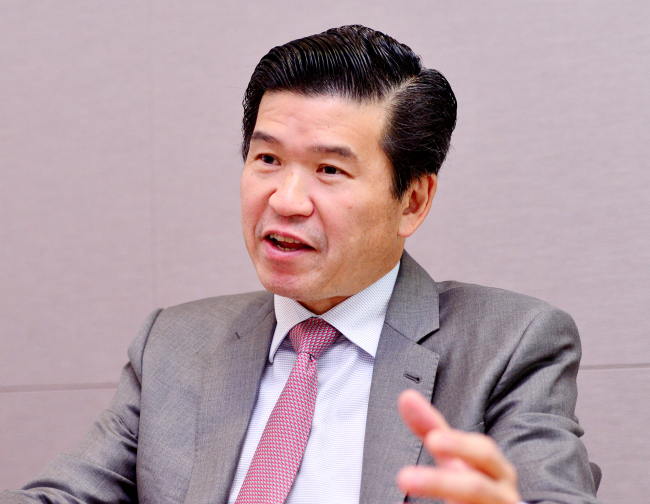 If foreign companies follow Korean rules with the right business models, they can be successful here, by taking advantage of its manpower, consumers and the presence of multinational companies, he said. “Despite some of the challenges, the reason why thousands of American companies are doing business here is because they are making money,” he said. Currently, there are around 2,100 American companies doing business in Korea, according to government data. “Look at WeWork, Lina Life Insurance and Kelly Services. They are good examples as their business have been growing here tremendously. Korea is one of the largest businesses in the world for them,” the chairman said. WeWork, the US co-working space provider, advanced into Korea in 2016 and has now grown into a community that can accommodate around 15,000 people, by targeting startups and venture capitals in Seoul. For Lina Life Insurance, Korea is the second-largest market outside the US. Since it came to Korea 30 years ago, it has now become the fourth-largest life insurance provider in Korea in terms of net profits. The US office of staffing firm Kelly Services has also fast grown to reach 45 billion won in revenue this year since it opened its local office in 2008. The merits he referred to are the nation’s educated and hard-working workforce, consumers as an ideal test-bed, the presence of multinational companies, a safe environment with no natural disasters and the government’s strong willingness to create the right environment for foreign investors. Foreign direct investment in Korea has gradually risen from $13.6 billion in 2011 to $22.9 billion in 2017. From January to September this year, the figure has already reached $19.2 billion. As the chairman of AmCham, he urged the Korean government to further ease regulations to reduce the burdens on foreign companies and give them more opportunities. “There are still many regulations that only exist in Korea. That loses an opportunity for foreign companies,” he said, citing some examples of motorcycles on highways and cloud centers. “Korea is the only country where motorcycles cannot run on highways. This can take opportunities from many European and the US companies, including Harley-Davidson,” Kim said. All OECD nations allow motorcycles with 50 cc engines to run on highways except Korea, which bans it for safety purposes. “Another example is cloud (computing). In Korea, you cannot put certain data on cloud and the use on cloud may be more difficult in the future if data centers are not physically stationed here,” the chairman said. In Korea, personal information cannot be used in cloud centers, unlike to the US, where it is allowed as long as the information is encrypted. Also, in Korea, there is an ongoing move in politics that in order to use cloud computing, the data center should be stationed in Korea, which has put pressure on multinational tech firms. On Friday, AmCham hosted the AmCham Doing Business in Korea Seminar 2018, which was attended by around 150 distinguished guests, including officials from the US, Korean and European governments and CEOs of foreign companies. At the event, leaders of five major foreign chambers of commerce in Korea -- the US, British, Europe, French and German chambers -- gathered to discuss issues such as the strengths of the Korean market, the Korean economic outlook, Korea’s regulatory environment, fair trade, the Fourth Industrial Revolution, labor regulations, and more. They signed a Joint Statement pledging to fully cooperate with the Korean government to resolve these issues in mutually beneficial ways. The Joint Statement also specified the foreign chambers’ willingness to promote innovation and increased investment in the Korean economy.